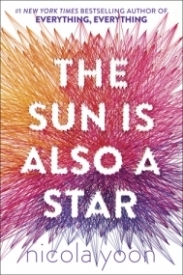 The Sun is Also a Star tells the story of Natasha, who’s an illegal immigrant, and Daniël, who’s born in America but is still haunted by his Japanese roots. In the book that takes place in a single day and uses ], where she’d lived until she was eight years old and immigrated to America with her brother and her parents. Her father had the dream to become a famous American actor, but it didn’t quite work out that way for him. Natasha believes in science, not in faith or love. Daniël on the other hand, seems to have it all figured out. Or better said: his parents have it figured out for him. He’s going to be a doctor. They say. But Daniël wants to be a poet. When their paths cross, Daniël knows for sure: Natasha is THE ONE. If only he knew what Natasha was hiding from him. The story is told from both Natasha’s and Daniël’s perspectives, but sometimes there’s a narrator who informs the reader about important information to fill in the blanks of the story. Sometimes it feels a bit random, but in the end, when things come together, it kind of makes sense again. It breaks up the story in a good way. It never bores. The chapters are really short. I had to get used to that at first, but in the end it really made sense. The book covers just one day in their lives, and that is, in a sense, really short. Eventhough you only get to know these characters for a short period of time, you will really know them at the end. The story is written very honestly. Daniël seems to be speaking his mind all the time, something he blames on Natasha. At the same time, Natasha doesn’t really say a lot to Daniël, but her stream of thoughts tells the readers what they should know. The tension of knowing things that Daniël doesn’t know, makes the book exciting. It comes down to this: what will happen when Daniël finds out about Natasha’s deportation? I think the characters are written very honestly: Natasha is very different from Daniël yet they feel both really real. Nicola Yoon knows how to make her characters work all the time. Daniël feels a bit ‘too good to be true’ at the beginnen of the book, but later on it becomes clear that his life is far from perfect. The dynamic between these two characters is the element that will make it for an intriguing story about love, family and identity. There’s no way you will not ship these characters – it’s still a romance novel in the end. I think The Sun is Also a Star covers a really realistic, modern and now-a-days problem. It is written with a fresh look on what it means to grow up: seeing you parents in a different light, making real choices and falling in love for the first time. The story of Natasha and Daniël will sweep you off your feet, it will make you laugh and it will make you cry ALL at the same time. Incredibly funny and honest!